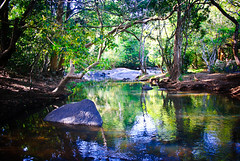 Kuruva Dweep is a series of islands formed on the Kabini river in the Wayanad district of Kerala. Kabini is Tributary of Cauvery river. Dweep in Malayalam means island. The Kabini river splits in to two at the Kuruva Dweep and joins back again. With an area of 950 acres, Kuruva Dweep hosts a variety of plants and animals. Although much of the river is shallow in these islands , some regions are very deep. In those deep regions crocodiles can be found. Boating facility is provided here by the District Tourism Promotion Council of Wayanad. Best time to visit Kuruva Dweep is during December to May. Kuruva Dweep is 280km from Bangalore. Route 1: Bangalore - Mysore - Nanjangudu - Gundelpet - Sulthan Bathery - Panamaram - Koyileri - Kuruva Dweep. KeralaSRTC and KarnatakaSRTC runs direct buses from Bangalore to Sulthan Bathery. From Sulthan Bathery KeralaSRTC and private buses are available till Koyileri. From Koyileri very few buses are available to Kuruva Dweep. Other option is to reach Mananthavady from Sulthan Bathery in KeralaSRTC or private buses from Sulthan Bathery. From Mananthavady very few buses are available to Kuruva Dweep. Private cabs and autos are available at Mananthavady which can be hired to reach Kuruva Dweep.